Xylocopa violacea (Linnaeus 1758) This carpenter bee is on top of a piece of wood. Carpenter bees are any of the species of bees belonging to the taxonomic sub-family Xylocopinae (large and small carpenter bees). There are only two genera of carpenter bees; ceratina and xylocopa. Carpenter bees belong to phylum Arthropoda which means joint footed. In the world, about 730 species of carpenter bees are known to exist. Carpenter bees go through complete metamorphosis. When we think of bees, we often think of bees that create hives and flourish as a group. However, carpenter bees are solitary bees that mate, and hibernate over winter. Large carpenter bees can be up to one inch long, but small carpenter bees tend to be much smaller. Carpenter bees have three body segments; the head, thorax, and abdomen. Only female carpenter bees have stingers. In the female, the eggs develop in the abdomen. Female carpenter bees have an ovipositor which deposits the eggs that are in her abdomen. Carpenter bees have two pairs of membranous wings like the rest of their order Hymenoptera that enable them to fly. The wings of the carpenter bee are attached to the thorax. Carpenter bees have three pairs of legs. The head contains the mouth part and antennae. Carpenter bees use their mandibles, which is part of their mouth part, to chew through wood for their nests and change pollen into nectar. Carpenter bees have compound eyes for seeing. Compound eyes have many lenses. Each lens looks out in a different direction giving the carpenter bee a unique view of the world. Carpenter bees have an exoskeleton which helps to protect them. They have to molt their exoskeleton every once in a while because the exoskeleton does not grow with the bee. Chitin, in the exoskeleton, gives the covering strength and mobility. Carpenter bees have an open circulatory system which means that the blood of the insect is not always in a vessel. The blood empties into cavities where it covers the organs of the insect. Also, carpenter bees have a ventral nervous system which contains ganglia, and a ventral nerve cord. Carpenter bees have jointed appendages. Carpenter bees undergo complete metamorphosis. Complete metamorphosis means that they go through four phases: egg, larva, pupa, and adult. During the larval stage, the animals main job is to eat. During the pupa stage, the insect begins to undergo change, which is controlled by hormones, and begins to form it's adult structures. Unlike most bees, carpenter bees are not social insects. Instead, work is divided between the male and female carpenter bee. The female lays the eggs and takes care of them, but the male carpenter bee guards the nest. Carpenter bees mate in the spring. 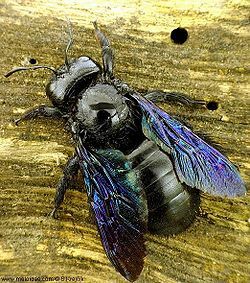 The first female carpenter bees to develop help the mother guard and take care of the younger carpenter bees. While they are taking care of the young, the mother is preparing to lay another round of eggs. While trying to mate, some males wait for females to come to them, while other males chase after female carpenter bees to get their attention. Male carpenter bees appear to be harmful, when in reality, they are harmless because they do not have a stinger. Female carpenter bees, however, possess a stinger, and sting if they feel threatened. Carpenter bees hibernate over the winter, and come out of hibernation during the springtime. In the development of the young carpenter bee larvae, temperature plays a key role in how fast the larvae become adults. Male carpenter bees die soon after they mate. 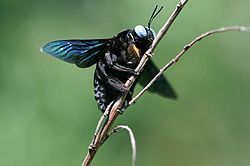 Carpenter bees reproduce sexually, and the female carpenter bees store the sperm from the male until she lays her eggs. Carpenter bee on top of a flower. Female carpenter bees bore their homes in wood and construct their nests by themselves. Common wood types that carpenter bees prefer to make their nests in are fir, pine, cypress, redwood, and cedar. Female carpenter bees construct cells in each tunnel in their home which contains one egg and food for that egg. The larvae eat pollen that the mother supplies for them when they are in their nests. Carpenter bees live for about one year. Carpenter bees do not eat the wood that they create their nest from, but pollen and nectar from flowers. Carpenter bees pollinate flowers which has a positive effect for their surroundings and for the ecosystem. Carpenter bees prefer to expand on their old nests rather than building a new nest. Woodpeckers are one of the major predators of the carpenter bee larvae. Male carpenter bees act like they are dangerous because they are very protective of their nests. He appears as if he could hurt you, but once again, the male has no stinger. As long as carpenter bees are not nesting in or around your home, they are a great benefit to the ecosystem because they are such great pollinators of flowers. Xylocopa violacea cause minor wood damage. Carpenter bees are sometimes considered pests because they bore their nests in wood. They usually make their nests in old or decaying wood. However, carpenter bees do not make their nests in wood that is painted. One way that someone can easily prevent carpenter bees from invading their wood is to keep it well painted. The holes that carpenter bees make when they bore their nests only cause minor damage, but over time, more carpenter bees could potentially make more nests next to previous nests, causing further wood damage. Carpenter bees also leave a pollen stain next to where they have nested. Carpenter bees can also be very noisy which can sometimes be a nuisance, especially if they are by your house. Since bees are very good pollinators, using pesticides to kill the carpenter bees is not the best idea. Instead, using a bee control that prevents bees from nesting in a certain area is a better approach to manage carpenter bees. Carpenter bees are important to pollination because they, unlike other solitary bees, have longer periods of being active. Also, they are good pollinators because they feed on many varieties of plants. Unlike large carpenter bees, small carpenter bees do not have as much of an economic importance. ↑ 1.0 1.1 Subfamily Xylocopinae - Carpenter Bees. Bug Guide: Iowa State University.. Web. October 26, 2011 (accessed). Author unknown. ↑ Porch, and Batdorf. Biology with Laboratory Exercises. South Carolina: Bob Jones University Press, 2005. 476. Print. ↑ Carpenter Bee.Designed by Kozhukhov, Oleg. Everything About. Web. (accessed) November 22,2011. ↑ 5.0 5.1 5.2 Smith,Nancy. Differences Between Carpenter Bees & Bumble Bees. eHOW. Web. (accessed)November 2, 2011. ↑ 6.0 6.1 Grover, Sam.10 Facts About Carpenter Bees. eHOW. Web. (accessed) November 13, 2011. ↑ 7.0 7.1 Davis, Guinn Terry. The Body Parts of a Carpenter Bee eHow. Web. (revised) June 14, 2011. ↑ 11.0 11.1 11.2 Jones,Susan C. Carpenter Bees. Ohioline.. Web. (accessed)November 2, 2011. ↑ Laboy, Carmen. How Do Carpenter Bees Reproduce?. eHow. Web. (accessed) November 2, 2011. ↑ 14.0 14.1 Potter, Mike. Carpenter Bees. The University of Kentucky College of Agriculture. Web. (revised) January 10, 2010. ↑ 15.0 15.1 Lindell, John. About Carpenter Bees. eHOW. Web. (accessed) November 13, 2011. ↑ 17.0 17.1 17.2 17.3 Carpenter Bees. Buzz About Bees.net.. Web. November 2, 2011 (accessed) Author unknown. ↑ Houseman, Richard M. Carpenter Bees. University of Missouri Extension.. Web. (revised)August 2007. ↑ Craig, Diane. What Do Carpenter Bees eat? eHow. Web. (accessed)November 2,2011. ↑ 20.0 20.1 CARPENTER BEE Xylocopa spp National Park Service. Web. (revised) February 3, 2011]. ↑ McCarty, Em Connell. What Are Carpenter Bees?. eHow. Web. (accessed) November 20, 2011. ↑ Keasar, Tamar. Large Carpenter Bees as Agricultural Pollinators. Hindawi Publishing Corporation. Web. (accessed) November 5, 2011. ↑ Grissell, E.E., and Sanford, Malcolm T. small carpenter bees. Featured Creatures. Web. (revised) October 2002. This page was last modified on 15 August 2014, at 15:12.